My Visit to Niagara (1876) is a delightful account of Hawthorne's experiences, both in solitude and observances of fellow tourists, experiencing the majesty of the falls for the first time. "I had come thither, haunted with a vision of foam and fury, and dizzy cliffs, and an ocean tumbling down out of the sky,—a scene, in short, which nature had too much good taste and calm simplicity to realize." Never did a pilgrim approach Niagara with deeper enthusiasm than mine. I had lingered away from it, and wandered to other scenes, because my treasury of anticipated enjoyments, comprising all the wonders of the world, had nothing else so magnificent, and I was loath to exchange the pleasures of hope for those of memory so soon. At length the day came. The stage-coach, with a Frenchman and myself on the back seat, had already left Lewiston, and in less than an hour would set us down in Manchester. I began to listen for the roar of the cataract, and trembled with a sensation like dread, as the moment drew nigh, when its voice of ages must roll, for the first time, on my ear. The French gentleman stretched himself from the window, and expressed loud admiration, while, by a sudden impulse, I threw myself back and closed my eyes. When the scene shut in, I was glad to think, that for me the whole burst of Niagara was yet in futurity. We rolled on, and entered the village of Manchester, bordering on the falls. I am quite ashamed of myself here. Not that I ran, like a madman to the falls, and plunged into the thickest of the spray,—never stopping to breathe, till breathing was impossible: not that I committed this, or any other suitable extravagance. On the contrary, I alighted with perfect decency and composure, gave my cloak to the black waiter, pointed out my baggage, and inquired, not the nearest way to the cataract, but about the dinner-hour. The interval was spent in arranging my dress. Within the last fifteen minutes, my mind had grown strangely benumbed, and my spirits apathetic, with a slight depression, not decided enough to be termed sadness. My enthusiasm was in a deathlike slumber. Without aspiring to immortality, as he did, I could have imitated that English traveller, who turned back from the point where he first heard the thunder of Niagara, after crossing the ocean to behold it. Many a Western trader, by the by, has performed a similar act of heroism with more heroic simplicity, deeming it no such wonderful feat to dine at the hotel and resume his route to Buffalo or Lewiston, while the cataract was roaring unseen. Such has often been my apathy, when objects, long sought, and earnestly desired, were placed within my reach. After dinner—at which an unwonted and perverse epicurism detained me longer than usual—I lighted a cigar and paced the piazza, minutely attentive to the aspect and business of a very ordinary village. Finally, with reluctant step, and the feeling of an intruder, I walked towards Goat Island. At the tollhouse, there were further excuses for delaying the inevitable moment. My signature was required in a huge ledger, containing similar records innumerable, many of which I read. The skin of a great sturgeon, and other fishes, beasts, and reptiles; a collection of minerals, such as lie in heaps near the falls; some Indian moccasins, and other trifles, made of deer-skin and embroidered with beads; several newspapers from Montreal, New York, and Boston;—all attracted me in turn. Out of a number of twisted sticks, the manufacture of a Tuscarora Indian, I selected one of curled maple, curiously convoluted, and adorned with the carved images of a snake and a fish. Using this as my pilgrim’s staff, I crossed the bridge. Above and below me were the rapids, a river of impetuous snow, with here and there a dark rock amid its whiteness, resisting all the physical fury, as any cold spirit did the moral influences of the scene. On reaching Goat Island, which separates the two great segments of the falls, I chose the right-hand path, and followed it to the edge of the American cascade. There, while the falling sheet was yet invisible, I saw the vapor that never vanishes, and the Eternal Rainbow of Niagara. It was an afternoon of glorious sunshine, without a cloud, save those of the cataracts. I gained an insulated rock, and beheld a broad sheet of brilliant and unbroken foam, not shooting in a curved line from the top of the precipice, but falling headlong down from height to depth. A narrow stream diverged from the main branch, and hurried over the crag by a channel of its own, leaving a little pine-clad island and a streak of precipice, between itself and the larger sheet. Below arose the mist, on which was painted a dazzling sun-bow with two concentric shadows,—one, almost as perfect as the original brightness; and the other, drawn faintly round the broken edge of the cloud. Still I had not half seen Niagara. Following the verge of the island, the path led me to the Horseshoe, where the real, broad St. Lawrence, rushing along on a level with its banks, pours its whole breadth over a concave line of precipice, and thence pursues its course between lofty crags towards Ontario. A sort of bridge, two or three feet wide, stretches out along the edge of the descending sheet, and hangs upon the rising mist, as if that were the foundation of the frail structure. Here I stationed myself in the blast of wind, which the rushing river bore along with it. The bridge was tremulous beneath me, and marked the tremor of the solid earth. I looked along the whitening rapids, and endeavored to distinguish a mass of water far above the falls, to follow it to their verge, and go down with it, in fancy, to the abyss of clouds and storm. Casting my eyes across the river, and every side, I took in the whole scene at a glance, and tried to comprehend it in one vast idea. After an hour thus spent, I left the bridge, and, by a staircase, winding almost interminably round a post, descended to the base of the precipice. From that point, my path lay over slippery stones, and among great fragments of the cliff, to the edge of the cataract, where the wind at once enveloped me in spray, and perhaps dashed the rainbow round me. Were my long desires fulfilled? And had I seen Niagara? O that I had never heard of Niagara till I beheld it! Blessed were the wanderers of old, who heard its deep roar, sounding through the woods, as the summons to an unknown wonder, and approached its awful brink, in all the freshness of native feeling. Had its own mysterious voice been the first to warn me of its existence, then, indeed, I might have knelt down and worshipped. But I had come thither, haunted with a vision of foam and fury, and dizzy cliffs, and an ocean tumbling down out of the sky,—a scene, in short, which nature had too much good taste and calm simplicity to realize. My mind had struggled to adapt these false conceptions to the reality, and finding the effort vain, a wretched sense of disappointment weighed me down. I climbed the precipice, and threw myself on the earth, feeling that I was unworthy to look at the Great Falls, and careless about beholding them again. All that night, as there has been and will be, for ages past and to come, a rushing sound was heard, as if a great tempest were sweeping through the air. It mingled with my dreams, and made them full of storm and whirlwind. Whenever I awoke, and heard this dread sound in the air, and the windows rattling as with a mighty blast, I could not rest again, till looking forth, I saw how bright the stars were, and that every leaf in the garden was motionless. Never was a summer night more calm to the eye, nor a gale of autumn louder to the ear. The rushing sound proceeds from the rapids, and the rattling of the casements is but an effect of the vibration of the whole house, shaken by the jar of the cataract. The noise of the rapids draws the attention from the true voice of Niagara, which is a dull, muffed thunder, resounding between the cliffs. I spent a wakeful hour at midnight, in distinguishing its reverberations, and rejoiced to find that my former awe and enthusiasm were reviving. 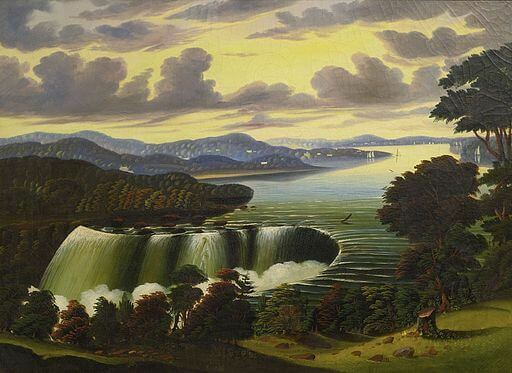 Gradually, and after much contemplation, I came to know, by my own feelings, that Niagara is indeed a wonder of the world, and not the less wonderful, because time and thought must be employed in comprehending it. Casting aside all preconceived notions, and preparation to be dire-struck or delighted, the beholder must stand beside it in the simplicity of his heart, suffering the mighty scene to work its own impression. Night after night, I dreamed of it, and was gladdened every morning by the consciousness of a growing capacity to enjoy it. Yet I will not pretend to the all-absorbing enthusiasm of some more fortunate spectators, nor deny that very trifling causes would draw my eyes and thoughts from the cataract. The last day that I was to spend at Niagara, before my departure for the Far West, I sat upon the Table Rock. This celebrated station did not now, as of old, project fifty feet beyond the line of the precipice, but was shattered by the fall of an immense fragment, which lay distant on the shore below. Still, on the utmost verge of the rock, with my feet hanging over it, I felt as if suspended in the open air. Never before had my mind been in such perfect unison with the scene. There were intervals, when I was conscious of nothing but the great river, rolling calmly into the abyss, rather descending than precipitating itself, and acquiring tenfold majesty from its unhurried motion. It came like the march of Destiny. It was not taken by surprise, but seemed to have anticipated, in all its course through the broad lakes, that it must pour their collected waters down this height. The perfect foam of the river, after its descent, and the ever-varying shapes of mist, rising up, to become clouds in the sky, would be the very picture of confusion, were it merely transient, like the rage of a tempest. But when the beholder has stood awhile, and perceives no lull in the storm, and considers that the vapor and the foam are as everlasting as the rocks which produce them, all this turmoil assumes a sort of calmness. It soothes, while it awes the mind. Leaning over the cliff, I saw the guide conducting two adventurers behind the falls. It was pleasant, from that high seat in the sunshine, to observe them struggling against the eternal storm of the lower regions, with heads bent down, now faltering, now pressing forward, and finally swallowed up in their victory. After their disappearance, a blast rushed out with an old hat, which it had swept from one of their heads. The rock, to which they were directing their unseen course, is marked, at a fearful distance on the exterior of the sheet, by a jet of foam. The attempt to reach it appears both poetical and perilous to a looker-on, but may be accomplished without much more difficulty or hazard, than in stemming a violent northeaster. In a few moments, forth came the children of the mist. Dripping and breathless, they crept along the base of the cliff, ascended to the guide’s cottage, and received, I presume, a certificate of their achievement, with three verses of sublime poetry on the back. My contemplations were often interrupted by strangers, who came down from Forsyth’s to take their first view of the falls. A short, ruddy, middle-aged gentleman, fresh from Old England, peeped over the rock, and evinced his approbation by a broad grin. His spouse, a very robust lady, afforded a sweet example of maternal solicitude, being so intent on the safety of her little boy that she did not even glance at Niagara. As for the child, he gave himself wholly to the enjoyment of a stick of candy. Another traveller, a native American, and no rare character among us, produced a volume of Captain Hall’s tour, and labored earnestly to adjust Niagara to the captain’s description, departing, at last, without one new idea or sensation of his own. The next comer was provided, not with a printed book, but with a blank sheet of foolscap, from top to bottom of which, by means of an ever-pointed pencil, the cataract was made to thunder. In a little talk, which we had together, he awarded his approbation to the general view, but censured the position of Goat Island, observing that it should have been thrown farther to the right, so as to widen the American falls, and contract those of the Horseshoe. Next appeared two traders of Michigan, who declared, that, upon the whole, the sight was worth looking at, there certainly was an immense water-power here; but that, after all, they would go twice as far to see the noble stone-works of Lockport, where the Grand Canal is locked down a descent of sixty feet. They were succeeded by a young fellow, in a homespun cotton dress, with a staff in his hand, and a pack over his shoulders. He advanced close to the edge of the rock, where his attention, at first wavering among the different components of the scene, finally became fixed in the angle of the Horse shoe falls, which is, indeed, the central point of interest. His whole soul seemed to go forth and be transported thither, till the staff slipped from his relaxed grasp, and falling down—down—down—struck upon the fragment of the Table Rock. In this manner I spent some hours, watching the varied impression, made by the cataract, on those who disturbed me, and returning to unwearied contemplation, when left alone. At length my time came to depart. There is a grassy footpath, through the woods, along the summit of the bank, to a point whence a causeway, hewn in the side of the precipice, goes winding down to the Ferry, about half a mile below the Table Rock. The sun was near setting, when I emerged from the shadow of the trees, and began the descent. The indirectness of my downward road continually changed the point of view, and showed me, in rich and repeated succession, now, the whitening rapids and majestic leap of the main river, which appeared more deeply massive as the light departed; now, the lovelier picture, yet still sublime, of Goat Island, with its rocks and grove, and the lesser falls, tumbling over the right bank of the St. Lawrence, like a tributary stream; now, the long vista of the river, as it eddied and whirled between the cliffs, to pass through Ontario toward the sea, and everywhere to be wondered at, for this one unrivalled scene. The golden sunshine tinged the sheet of the American cascade, and painted on its heaving spray the broken semicircle of a rainbow, heaven’s own beauty crowning earth’s sublimity. My steps were slow, and I paused long at every turn of the descent, as one lingers and pauses, who discerns a brighter and brightening excellence in what he must soon behold no more. The solitude of the old wilderness now reigned over the whole vicinity of the falls. My enjoyment became the more rapturous, because no poet shared it, nor wretch devoid of poetry profaned it; but the spot so famous through the world was all my own! Add My Visit to Niagara to your own personal library.